London's parks and gardens have never looked to good before! The photographs in this book are really excellent. With few exceptions, they are beautiful to look at, representative of the places they illustrate - and rather flattering. London residents will be proud to see their parks and gardens looking so well. Visitors to London could find the contrast between the photographs and the reality reminds them of a that between a film star on set and a film star with a hangover, queuing at the airport for a late flight to America after splitting up with her partner. This contrast makes one wonder who the book is aimed at. 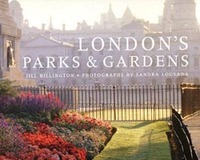 Since it is a coffee table production, not suited to a suitcase or the pocket of an anorak, one cannot imagine it being taken on a tour of London's parks and gardens. There is a map showing the location of parks and gardens but no way of using it as an index to the pages on which they are described. The text is engagingly written but aimed squarely at the general reader rather than the historian. It tells you what you can expect to find in the course of a visit, not what is of interest to a design historian. Especially for the modern projects, there are few details of who was responsible for the design, when the place was created or what trends in design are represented. Where information is given on these matters it is incomplete and sometimes inaccurate. In the case of Greenwich Park, for example, we are told that 'The initial design was done by Le Nôtre' (p 207). In fact he only designed the grass parterre [see Greenwich Park and Le Nôtre.]. No designers are named for New River Walk, Mile End Park, Bunhill Fields, the re-design of Russell Square, the British Library Courtyard and many other places.